Excessive amounts of blueberries (Vaccinium spp.) on a bush, called over-cropping, are typically smaller berries of poorer quality. To prevent this, prune canes to reduce the number of berry-producing buds. Fruit buds grow on new shoots one year before berries appear. Annual, moderate pruning of blueberry bushes will result in fewer canes but larger berries and greater, more consistent yields. Proper pruning will ensure good yields of large blueberries. Blueberries like well-drained, acidic soil with a pH between 4.5 to 5.5. The most widely grown species, highbush blueberries (Vaccinium corymbosum), grow from 6 to 12 feet tall in U.S. Department of Agriculture plant hardiness zones 3a through 8b. Rabbiteye blueberries (Vaccinium ashei) grow 6 to 8 feet tall in USDA zones 7a through 9B. Lowbush blueberries (Vaccinium augustifoliam) grow from 6 inches to 2 feet tall in USDA zones 2a to 6b. Prune blueberries in late winter to early spring after the chance of freezing weather has passed. If you delay pruning a bush for a year or more then prune it heavily, canes maturing simultaneously will yield fewer berries. Pruning after harvesting berries will decrease long-term yield and make a bush susceptible to winter injury. Use hand-pruning shears to remove 1-year-old wood and a pruning lopper or hand saw to remove 2- to 3-year-old wood. Disinfect pruning tools before use by soaking them for five minutes in 1 part household bleach to 3 parts water and let air dry. Allowing young bushes to produce berries can stunt their growth, leading to several years of substantially lower harvests. To prevent this, prune the round, plump fruit buds 2 to 3 inches from the tips of the shoots. Prune to shape an upright plant that lets sunlight into the interior. Remove twisted and low-growing canes at the start of the third year. Prune low-growing weak shoots from the bottom of young bushes. Since they'll be shaded by vigorous shoots above them, they won't be productive. Thicker, higher shoots will bloom later and bear larger berries. Pruning young, vigorous shoots to 4 to 6 inches below the top of the bush will stimulate side branches, increasing berry yields. If a bush grew more than two new canes the previous year, prune all but the two most vigorous new canes at the level of the crown. Continue this light pruning until the bush reaches full maturity at about six years. 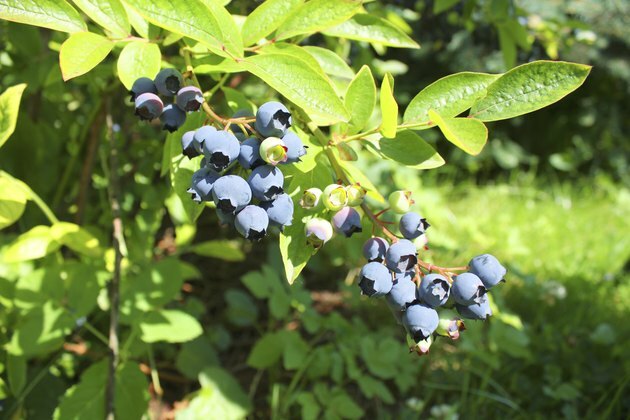 Blueberry canes give smaller yields and poorer quality berries after they're fully mature. Eight-year-old canes need more leaves to support their berries. Since they have usually grown numerous branches, their new shoots on which berries grow are typically weak and thin. Prune one or two of the largest canes, including unproductive canes larger than 1 inch thick. Allow the same number of new canes to grow as replacements. If a bush contains a mix of different-aged canes, then you'll lose a minimal amount of berries by removing 8-year-old canes each year. Seven-year-old canes will replace pruned 8-year-old canes. You can prune up to 20 percent of a bush without affecting its yield. There will be fewer, larger berries, but eventually the entire crown will be renewed. Since root suckers bear more berries than stump suckers on highbush cultivars, prune their old canes to the ground. Prune old canes of rabbiteye cultivars to 6 to 12 inches from the ground, forcing new, berry-producing canes to grow from their stumps. To rejuvenate a declining bush, prune diseased, insect-infested and dead canes, then weak canes shaded by large canes. Prune older canes throughout the canopy to let in more light and encourage new canes to grow. If the bush no longer produces berries, prune all canes to renew growth.